A Canton Country Day School education represents one of the most important investments in your child’s future. Canton Country Day School strives to make our education affordable by bridging the gap between what a family can afford and the actual cost of a Canton Country Day School education from kindergarten through grade eight. We believe that the cost of a Canton Country Day School education should not be a deterrent to any family, regardless of income. While we do not offer 100 percent full-ride scholarships through our internal flexible tuition process, we do offer options to families that qualify. Last school year, CCDS generously awarded over $900,000 dollars in aid and scholarships. While we do attempt to meet as many families needs as possible, grants and scholarships are limited and distributed on a first come, first served basis. Families generally are expected to contribute a minimum of $4,345 of their child's tuition. To determine your tuition options, CCDS uses a program called FACTS that a family must complete. An Educational Funding Committee reviews all information and determines financial aid award offers. This review and consideration is completely separate from the admission review and acceptance process. For Financial FAQ click here. *Other Pre-K and Jr.-K options available. If you are having issues with your FACTS application, please contact Mr. Pence or call FACTS customer support at 866-315-9262. In an effort to provide as much information as possible to families to make an informed decision, we created a basic guide to explain how our flexible tuition works. 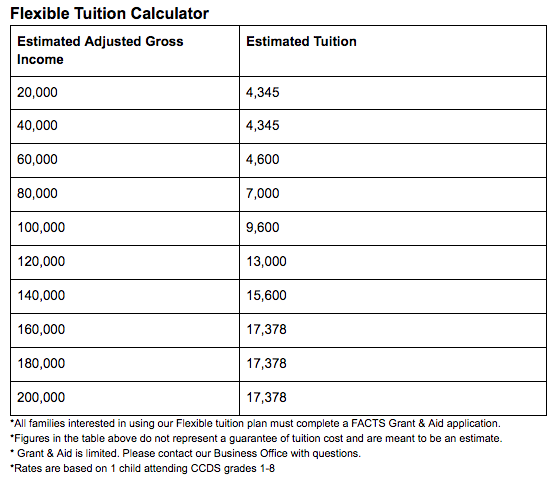 The table below provides an estimate of what a tuition cost will be for families at different income levels. All families who would like to use our flexible tuition, must complete a FACTS Grant and Aid application and be admitted into the school. Tuition Loan programs assist many families in making tuition payments more affordable by providing funds upfront and spreading the payments over a longer period of time than the school’s tuition payment plans allow. Extended payment plans are available from Your Tuition SolutionSM. Plans range from 24 to 84 months and cover tuition amounts to $50,000. Interest rates are fixed and can be as low as 3.99% APR. There are no application or origination fees and no prepayment penalty which allows parents to pay the loan off early if they’d prefer. 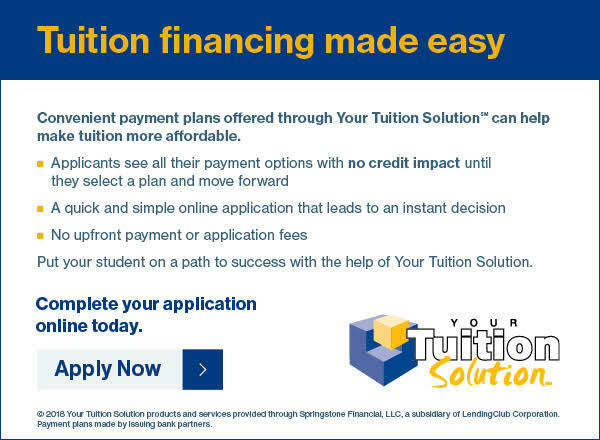 You can calculate monthly payments, learn more, or apply online at yourtuitionsolution.com. Canton Country Day School has chosen to use FACTS to process all family flexible tuition requests. An application can be completed using this link ( application will be open starting January 12, 2019). Tuition insurance through Dewars is required of all families who enroll in our payment plan. Tuition insurance can also be purchased by families who pay in full, but is not required.